When a dispute settlement happens it is a disappointment with the service that has been provided by the moving company. Many times consumers want to get their issues solved and handled immediately, especially if there is damage to anything. If you have a dispute with a moving company, the first action they will request you to do is to fill out a claim form. This claim form is normal prior to filling out an arbitration claim form. Only when a claim form has not fulfilled the exchange between the customer and the moving company is when an arbitration dispute form is required. Here is a video you should watch explaining about a claim form. Once the claims procedure has been exhausted hopefully you have a clear settlement and your moving claim has been handled. If your moving claim has not been handled then the consumer has the right to file for arbitration. The household goods arbitration program exists to weigh out each party’s considerations in consideration to the claim. This is done with neutral parties that have no affiliation with either party. This is a customer that had household goods transported or moving company that performed moving service. Always provide a brochure of the arbitration program or a link to the arbitration program. If you booked with a broker, you wouldn’t necessarily do the arbitration with the broker but with the carrier or moving company that performed your job. Below is a video that will explain a little better about filing an arbitration dispute form. By purchasing arbitration with us, you will be able to dispute settlements with your customers easily and affordably. Settling disputes will take no time at all. Other arbitration programs charge more for having disputes on moving and storage. We charge only $185 for all types of settlements. 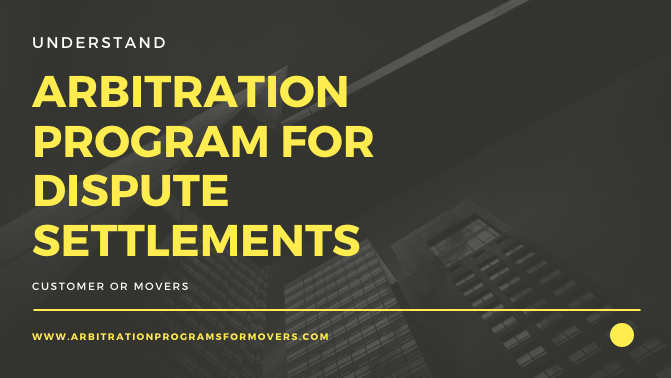 Our hhg arbitration program is an affordable option for anyone who is just beginning their business in the moving industry. Our low cost for arbitration makes it a low-risk investment, so even if you do not decide to follow through with your plans in the industry, you will not lose a lot of money for it. With other arbitration programs, there is more to lose because of the cost of their programs relative to ours. Choose our arbitration program and start moving your customers today! Getting arbitration is easy! Start by calling us at 702-333-2430. Our associates will be on the line to help you start your application for arbitration. They will be able to guide you through the process of hhg arbitration and will be able to answer any questions regarding the process. Don’t wait if you have any questions on the process as we are always available to help movers. if you don’t understand any arbitration program definition give us a call we are in the office Monday thru Friday 9am-5pm.